Bazeyan says oppostion won't be stopped by criminal proceedings. Later the same day the government announced its intention to prosecute, on grounds that the Ardarutiun (Justice) Bloc’s activity amounts to calling for an overthrow of the government by force and violates Paragraph 301 of the republic’s Criminal Code and its paragraph prohibiting insult of authorities. “By organizing mainly unsanctioned demonstrations in different regions of the republic and in communities of Yerevan and by insulting representatives of authorities in public, since February, 2004, representatives of Ardarutuin bloc and people acceding to them have been calling for seizing state power by force and changing the constitutional order of the Republic of Armenia,” the Prosecutor’s statement read. Yesterday (April 1), political elite from Justice bloc held a press conference led by former oppositional presidential candidate Stepan Demirchyan in which it restated its intentions to “carry out change of power as peacefully and without disruptions as possible”. The bloc is unhappy that a constitutionally-approved Referendum of Confidence was not held and says the referendum was the government’s chance for peaceful resolution, a means of replacing leaders who the opposition calls “illegitimate”. 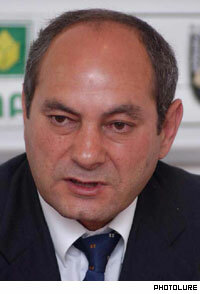 Opposition leader Albert Bazeyan says even criminal proceedings will not deter the bloc’s intentions. “Let those who talk about law and order, first look for law and order in their actions and let them account for October 27,” Bazeyan said. The oppositon continues to accuse the President, Minister of Defense and Chief Prosecutor General of a failure of security that lead to terrorists assassinating seven government leaders in Parliament on October 27, 1999. Even relatives of oppositional leaders are being investigated. Authorities have searched Bazeyan's brother’s apartment and have called his nephew for questioning. At yesterday’s press conference oppostion leaders again refused to name the date when they expect mass to stage mass demonstrations which they believe will lead to a change of government.